for just You and I. Set a Foundation for this time. With each turn and tide. So I may refocus my purpose. Give my thoughts a secure path. Let not my foot fall outside of it. With gratitude and love in return. Actually here, and always. Everywhere. for me to draw and grow ever near to you. How Jesus lives for real. to show my faith and wonders. Today begins The 100 Day Project, a celebration of making. A process of surrender, a practice of showing up. Quickly and crystal clear, as if hearing God’s voice, I knew what my project would be. My project? 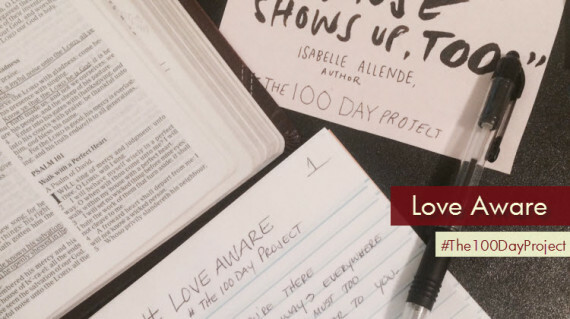 Love Aware – 100 days of love letters to God. With great anticipation, I am looking forward to the transformation sure to take place during this love affair I call Love Aware.